Write this down mister Neanderthal. Well, they weren't that good but they did do rock art. 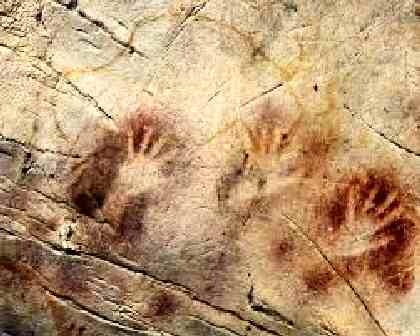 The oldest avenue of recorded expression for upright man consists of patterns in red ochre on cave walls in Spain 64,000 years ago done by H. neanderthalensis. Oral spray painting of the hand was also found. This was a step forward in using the body itself as a tool. Humans did not teach them. It seemed to ad hoc experimentation. They did it on their own. Yes, Neanderthals did it first. Significantly, they painted with a system of dots, much like Australian Aborigines. Moreover, sea shells were used as "paint" containers. The carapace were dated at 115,000 years. This theoretically pushes paintings far, far back. Humans began leaving their marks on walls when Aboriginals arrived on the southern continent - 50,000 before the present. Homo sapiens had the capacity to make images of animals: a pig deer, for example, in Indonesia.